SynaptiCAD announces the release of Gates-on-the-Fly (GOF), a Verilog netlist editor and incremental schematic viewer. GOF can edit very large netlists from a synthesis or layout tool that need changes to either meet timing closure specifications, fix functional logic bugs, or to repartition a design. 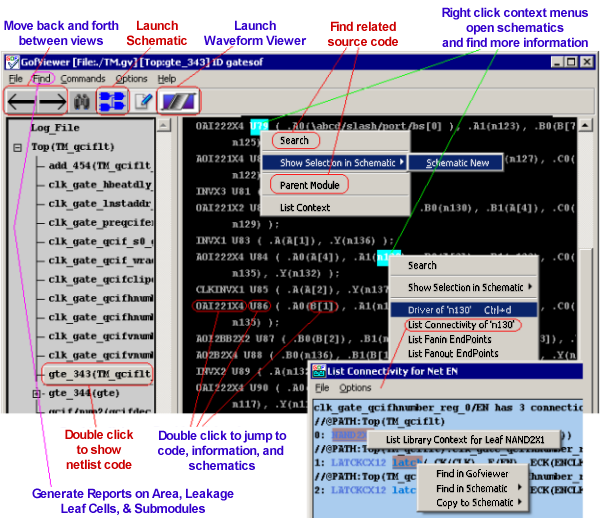 Users begin navigating through a netlist using GofViewer. GofViewer displays a netlist as a hierarchical tree of module instances with an associated text window that displays the actual netlist code. Nets and modules are hyperlinked so that double clicking will either: open up the definition of the object or display a leaf cell in a GofTrace schematic window. Right-click context menus provide functions for finding related loads, drivers, fanin, fanout, parent modules, etc. GofViewer also has an RTL-to-Netlist Matching feature to ease the process of locating nets in the netlist code that match signals from the original RTL code. 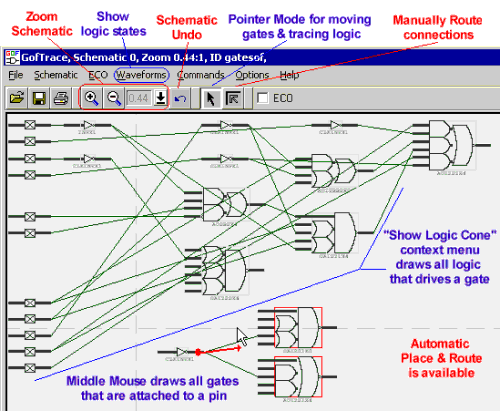 GofTrace is an incremental schematic viewer that lets designers quickly display relevant gates along a specified logic cone (set of related circuit paths). This is unlike other schematic tools which force a fixed placement of the gates that makes it difficult to rearrange the gates to visualize just the area of interest. A schematic can easily be expanded to examine a path of interest by middle-clicking on a pin to show the nets/gates connected to the pin. GofECO is a special mode of the schematic window that lets you make changes to the netlist. Once ECO mode is activated, the ECO buttons will take over many of the schematic features like saving files, undoing operations, and adding or deleting gates and nets, to ensure you are aware that the actual netlist is being changed and not just the schematic view. In addition to graphically performing ECOs, there are also two scripting methods for performing ECO operations: Logic Cone ECO and GofCall API scripts. The Logic Cone ECO interface accepts a script that changes the entire logic cone that drives a particular part and replaces it with a newly re-synthesized netlist. The GofCall API mimics most of the graphical ECO commands. The GofCall API lets the user focus on a set of desired logic changes, without having to specify all the low-level details involved in making the changes (such as adding hierarchical ports or naming newly created nets).